Frank Chodorov (1887–1966) was Nock’s protege, and also a magazine writer. 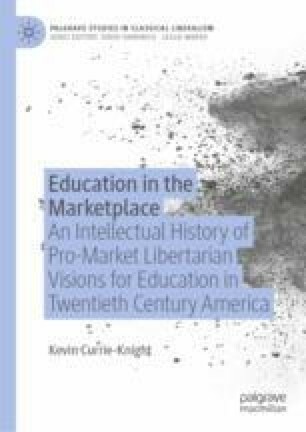 While Chodorov’s libertarian political philosophy resembled Nock’s in most areas, Chodorov was optimistic about the superiority of private enterprise in education. This, I argue, owes to the influence of the libertarian economist Ludwig von Mises, who stressed the importance of consumer sovereignty and suggested that economists should celebrate markets ability to satisfy consumer preferences rather than opine one what consumers should prefer. Chodorov ideally preferred no role for government in education, but compromised to support the minimal government function of giving individuals tax deductions/credits for money spent purchasing private education.